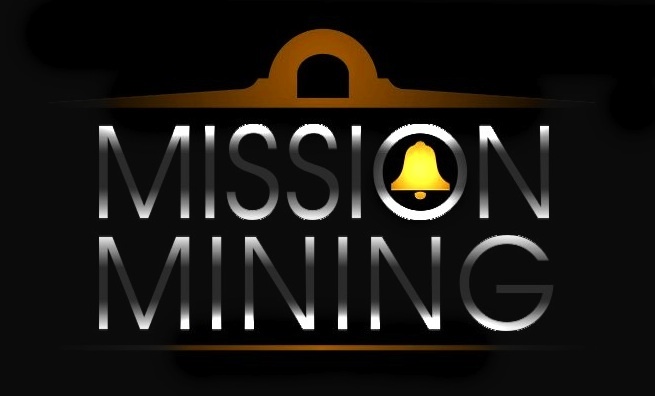 Mission Mining Company (OTC Pink: MISM) – Mission Mining Company is pleased to announce that the Company has executed a Letter of Intent with Colten Metals LLC, to execute an agreement for Mission Mining Company to lease, mine, and operate the El Dorado Mine in California. The El Dorado Mine claims are reported to hold extensive values / quantities of gold, platinum group metals, and rare earth metals, and have the potential to become one of the largest and most productive mining properties in North America. Production from the El Dorado Mine is anticipated to generate substantial revenues and profits for the Company on behalf of its shareholders, and ultimately propel the Company into position as a leader in the mining industry. The El Dorado Mine is comprised of seventeen (17) contiguous Bureau of Land Management lode claims comprising a total of three hundred forty (340) acres located in San Bernardino County, California. The El Dorado Mine claims are known as the El Dorado Lode Claims numbers 1 – 12, and the King of California Lode Claims numbers 1 – 5, collectively referred to by the Company as the El Dorado Mine. The Letter of Intent specifies the term of the mining and operating lease to be forty-nine years, with provisions for Mission Mining Company to be granted an extension of the lease for the duration of the property’s productive life. As compensation under the proposed agreement per the terms of the Letter of Intent, Colten Metals LLC, will receive a 9.0% Net Smelter Return Royalty (NSR Royalty) in respect of all salable metals and other products resulting from the Company’s operations on the seventeen El Dorado Mine claims as compensation. Rare Earth Elements – Based on historical reports and testing, the El Dorado Mine claims are expected to hold extensive values / quantities of gold, platinum group metals, and rare earth elements (REE). REE are necessary industrial components in the manufacture of alloys, magnets, lasers, fluorescent and mercury-vapor lamps, many aerospace components, and a myriad of other products utilized globally by consumers, industry, and government agencies. REE can be found in varying commercial quantities throughout the world, however China dwarfs the production of all other nations combined. As China now controls an estimated 97.0% of global production / markets of critical REE, political and economic pressures to identify and produce REE in the United States are mounting rapidly. Certain areas of California are known to hold extensive REE deposits. The potential presence of significant amounts of REE in the El Dorado Mine claims makes the property a valuable strategic addition to Mission Mining Company’s mining property portfolio. Based upon professional technical reports submitted by several qualified individuals and organizations, a Valuation Report was prepared in 2010 by a professional geologist on one of the seventeen El Dorado Mine claims. Although there is no certainty of the fact, the Company believes the results / values reflected in the report will likely be somewhat representative of the other sixteen claims comprising the El Dorado Mine. The property (one claim) evaluated in the subject report was the 20-acre lode-mining claim that is filed with the United States Bureau of Land Management (BLM). The report states that numerous geochemical samples had been collected for laboratory analytical testing, and the results indicated the contained gold values on the claim could reach up to four ounces of gold per ton of host material. In addition to gold, there are also silver, copper, iron, platinum, palladium, rhodium, rhenium, iridium, and rare earth metals values contained. The report indicated that the available information, reports, data, and maps indicate the mineralized zone on the 20 acre claim is estimated as being 1500 feet long, 600 feet wide, and 500 feet deep, thus containing approximately 16.7 million cubic yards of metal-bearing (host) rock in the subject claim. Based on a conversion factor of 1.5 tons of rock per cubic yard, there is an estimated 25 million tons of metal-bearing (host) rock contained in the El Dorado Lode Claim #8. Upon completing the anticipated execution of a final agreement for the El Dorado Mine, in addition to holding 100% ownership in the Gold Star Mine, Mission Mining Company will have the potential to become one of the largest mining companies in North America. Management continues its commitment to identify and secure ore-rich, world-class U.S. mining properties upon which its management team can build a reputable and profitable company on behalf of its shareholders. Mission Mining Company will focus on the acquisition and development of significant US gold and silver mining properties pursuant to its business plan to expeditiously and prudently develop the owned / leased mining properties and place them into production. The Company has recently acquired 100% ownership in the Gold Star mining property in western Nevada, which existing geological reports indicate holds substantial values in Measured, Indicated, and Inferred gold and silver metals. The Gold Star Mine contains 960 acres of alluvial deposits suitable for placer mining operations, and is located in Esmeralda County, Nevada, near the town of Goldfield. The Gold Star Mine will be one of Mission Mining Company’s primary development projects, as it demonstrates a combination of favorable characteristics, including a weather pattern which is benign and conducive to year-round operations, together with reasonable regulatory burdens and compliance requirements, a significantly large tonnage of host materials to process, with reasonable to good contained values per ton, the totality of which may result in a very long term and profitable gold and silver mining operation. Management’s commitment to restructure the Company on behalf of its shareholders, as evidenced by the decision to focus on the acquisition and development of suitable US precious metals and rare earth mining properties represents a timely and prudent business opportunity, as the saleable products will not become obsolete, and there will always be a significant demand and liquid market for the metals / rare earths produced. As a result of the acquisition of the Gold Star Mine, the Company has significantly increased its total booked assets, as reflected in its financial statements now on file with OTC Markets. This release may contain “forward-looking statements” within the meaning of Section 27A of the Securities Act of 1933, as amended, and Section 21E the Securities Exchange Act of 1934, as amended and such forward-looking statements are made pursuant to the safe harbor provisions of the Private Securities Litigation Reform Act of 1995. Those statements include statements regarding the intent, belief or current expectations of Mission Mining Company and members of its management, as well as the assumptions on which such statements are based. Prospective investors are cautioned that any such forward-looking statements are not guarantees of future performance and involve risks and uncertainties, and that actual results may differ materially from those contemplated by such forward-looking statements. Important factors currently known to management that could cause actual results to differ materially from those in forward-statements include fluctuation of operating results, the ability to compete successfully and the ability to complete before-mentioned transactions. The company undertakes no obligation to update or revise forward-looking statements to reflect changed assumptions, the occurrence of unanticipated events or changes to future operating results. This entry was posted in Uncategorized and tagged banks, bullion, currencies, currency, currency trading, deflation, depression, dollar, economic, economic collapse, economic news, economic recovery, economy, ETF, euro, Fed, Federal Reserve, finance, forex, global economy, global recession, gold, gold bars, gold bullion, gold coins, gold investing, gold mine, gold mines, gold mining, gold prices, gold stocks, IMF, inflation, investing, MISM, Mission Mining, Mission Mining Company, national debt, physical gold, physical silver, platinum, portfolio, precious metals, rare earth, recession, silver, silver bars, silver bullion, silver coins, silver investing, silver mine, silver mines, silver mining, silver prices, silver stocks, stock market, trading, World Bank. Bookmark the permalink.